EXCLUSIVELY AT NEIMAN MARCUS Velvet European sham. Fancy gimps and braids cross at corners and wrap edge. Rayon/silk. 25"Sq. Dry clean. Made in the USA of imported materials. EXCLUSIVELY AT NEIMAN MARCUS Ruched silk sham with scallop braid trim. Hidden zip closure. Front: silk. Back: polyester. Dry clean. 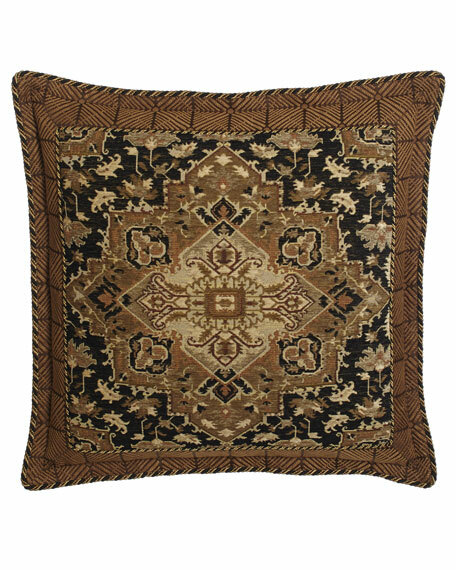 EXCLUSIVELY AT NEIMAN MARCUS Ruched silk sham with scallop braid trim. Hidden zip closure. Front: silk. Back: polyester. Dry clean. 25"Sq. Made in the USA of imported materials. EXCLUSIVELY AT NEIMAN MARCUS Scalloped edge sham with aqua onion trim. Front, polyester/rayon; back, polyester. Hidden zip closure. 25"Sq. Dry clean. Made in the USA of imported materials. EXCLUSIVELY AT NEIMAN MARCUS Allover aqua tweed with brush fringe and scallop trim. Hidden zip closure. Front, polyester/rayon chenille. Back, polyester. 25"Sq. Dry clean. Made in the USA of imported materials.